Our boutique firm has a global reach with a local touch. Interested in learning more about M&A activity on a global scale? Download your free copy of our Globalscope newsletter today! We'll also sign you up for future updates. As a partner firm with Globalscope International M&A Advisors, our team has the ability to work with 600 investment bankers around the world to provide custom solutions for our clients. 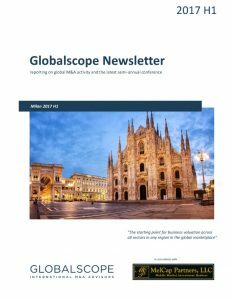 Our team has access to expert investment bankers around the world — learn more about Globalscope in our newsletter. Download your free copy today!